Festivalgoers have also been urged to carry "as little single-use plastic as possible". 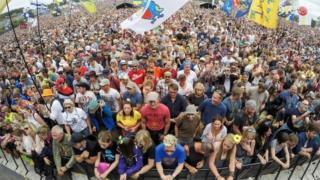 Organiser Emily Eavis encouraged ticket-holders to bring reusable bottles and said "hundreds of free water taps" would be available. A Glastonbury spokesman said more than one million plastic bottles were sold at 2017's event. Ms Eavis said it was "paramount for our planet" to reduce plastic consumption. Acts confirmed for this year's event include Janelle Monae, Stormzy and Kylie Minogue.